One of the things I am most excited about is the Dam Hoi, or Vietnamese Engagement Ceremony, which takes place one month before our American wedding. This is where the future-groom and his family come to my family’s house (where I’m supposed to still be living…oops), and bring gifts asking for my hand in marriage. This is the first time that our families would first meet, traditionally. Thuan has joked that I’m worth one pig. I hope it’s at least a Berkshire Heritage pig. 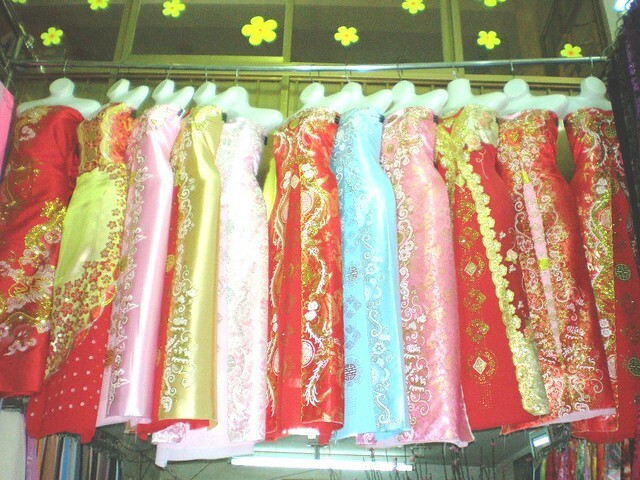 Although we’re blending traditions here, I am going to wear the traditional Ao Dai (ow yai), or Long Dress. This is fun because it can be in any color and style – totally up to the bride-to-be’s preference. My future mother- and sister-in-laws are helping in this process and I’m going to have my Ao Dai made in Vietnam. Unbelievably excited about this. Unfortunately I’m going to get measured this weekend, less than a week after gorging on BBQ and tacos in Austin. But what can you do. Now I’m not giving away any secrets about the color, exact style, and such, but I am really excited to honor this tradition and incorporate his Vietnamese heritage to our marriage. Back to the Dam Hoi – If Dad gives his blessing, then I would come out and receive an engagement ring from his family and come together for the “first” time with my fiancé. We would then return to my newly minted fiancé’s home for more ceremonial traditions. Here we honor his ancestors, say prayers and ask for their blessing. I understand there will be ‘blessing shots’ – my interpretive phrase, not theirs. This is where, with our parents, we will have a drink of some alcohol with each family member or friend in attendance who offer us their blessings and well wishes. His cousins are particularly excited about this part, I gather. Then, as I understand it, the party begins. There will be a gluttonous spread of Vietnamese food and lots of drink. 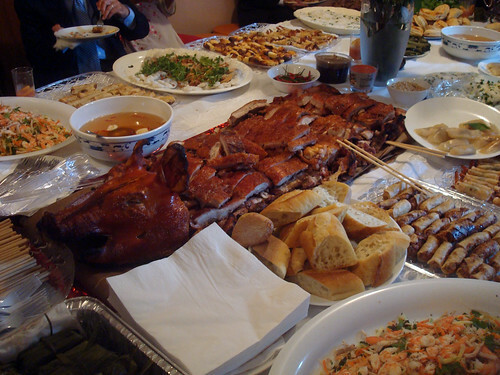 I’m sure our spread will look a lot like this one via sheepybee on Flickr. And then we have a few days to recover before Jay-Z and Justin Timberlake. I consider this my pre-wedding gift. California photographer Caroline Tran captured this gorgeous engagement ceremony. Seriously – how beautiful are these photos? This photography blog shows the engagement ceremony progression.